If you have a Smart Vent that won't power on regardless of trying out new batteries, there could be a few potential causes. Eject the battery cartridge for at least 35 minutes. Then with the batteries still out, press the black button (pictured below) a couple times. Finally, re-insert the battery cartridge again. 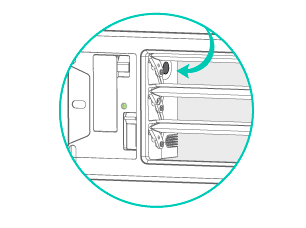 If your vent has been successfully paired to your account but isn't turning on, try ejecting your battery cartridge and removing the batteries, checking for any signs of corrosion damage. It has been reported on occasion that in some of our early units, the batteries leaked after exposure to high heat over time. If you see battery leakage, it can be cleaned with a cotton swab and some alcohol if you feel comfortable doing so. Once fully dry, insert fresh batteries and pop the cartridge back in. If this only fixes the issue intermittently, please contact support so we can send you replacement battery cartridges which will keep your vent's power connection firmly in place.